I first came to the Berlin Film Festival around 1966 with the great film producer, Sam Spiegel (“Lawrence of Arabia,” “On The Waterfront,” and many others) bringing “The Chase,” a film about racism which Spiegel produced and in which Marlon Brando, Robert Redford and Robert Duvall, also starred– among others). It was written, by the way, by Lillian Hellman and directed by Arthur Penn. Sam and I took time to cross to East Berlin through the heavily guarded gate, Check Point Charlie, as it was called. I remember being nervous as we passed through all the soldiers armed with serious weapons. I came back in 1990 right after the Berlin wall came down in order to interview women, students, artists and actors, in particular, about their feelings now that Germany was reunited, just as I did in the newly freed Czechoslovakia, Hungary and Poland. I was interested in exploring the role that actors and other artists had played in the fall of communism and how they were handling their new freedom. I learned that freedom is more complicated than one might have thought–but that is for another blog. Altogether, I’ve been here 4 or 5 times, usually to promote a film or book and have never had time to really be a tourist, which is what I want to do, and soon, because this is a fascinating city with a rich, complex history. 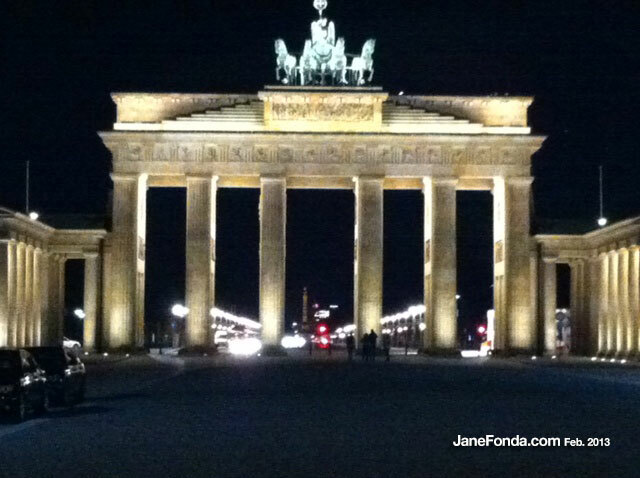 I am staying in the really beautiful Adlon Hotel, very close to the Brandenburg gate. This hotel has had a long and gloried history but was destroyed by bombs during WWII and, because of its proximity to the Berlin Wall, was not rebuilt until the mid-1990’s, once the Wall had been removed. Here is a view from my window in the snow. I had one day to get over jet lag (these days it takes me longer than that, but that’s all I could afford. I had work to do. I would have gone to see the Jewish Memorial with my hairstylist, Matthew Shield, during this rest day but that was the only time I had to watch the documentaries that have been nominated for an Oscar. I am a voting member of the Motion Picture Academy and this is the first year that members have received DVDs of the nominated documentaries which is exciting. I love documentaries and will have to be prepared to cast my ballot as soon as I am back in Los Angeles on Monday. 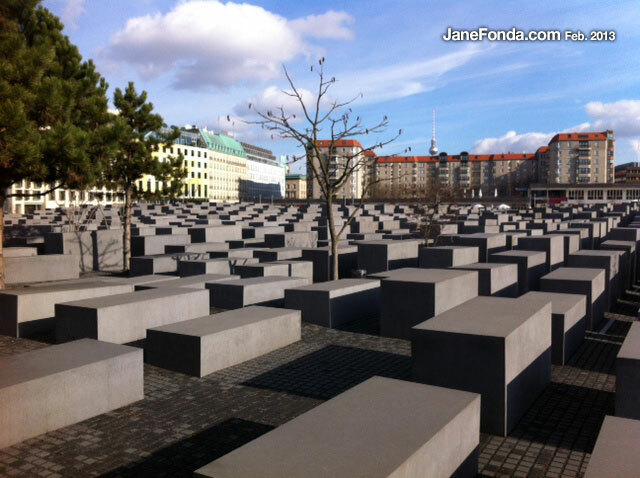 Here, by the way, are two pictures that Matthew took of the Jewish Memorial. 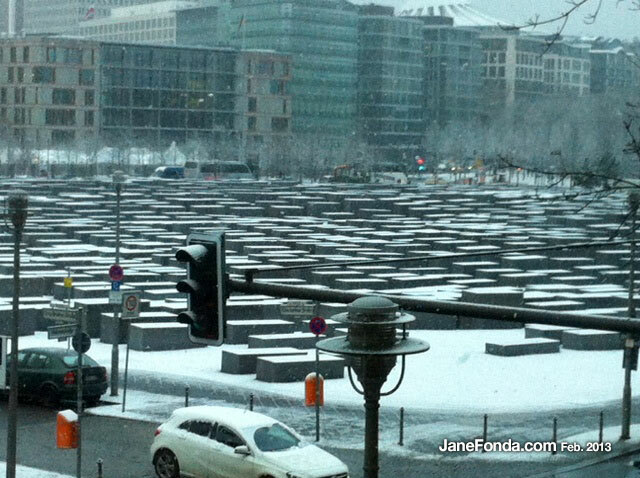 The Jewish Memorial in the snow. Alas, I had no time to visit the memorial but Matthew did and said it was very very moving. These are tomb-like sculptures about the memorial. I found all the documentaries exciting and important. One, “The Invisible War“, is about rapes and sexual harassment of women in the U.S. armed forces. This happens more than you can imagine and is tragic. Interviews were done with women in all branches of service who were so proud to serve, so desirous of making a career in the military. Many had fathers who served in previous wars. What has happened to so many of them (and a few men as well) at the hands of their male superiors is exposed in this film and, hopefully, because of that, something will be done to stop it from happening to more women. I just found out that a number of the women in the film (who now suffer PTSD as a result of their abuse) are receiving therapy at a ranch near Santa Barbara that I used to own. I always felt it was a healing place and I pray that will be the case for these women. Another documentary, “How to Survive a Plague,” tells the history of the spread of AIDS in the U.S. and the activism that forced the government and, in particular, the Health Department and various leading pharmaceutical companies, to change their research protocols and lessen the time it took them to test and put a new drug on the market. It is also instructive to witness the growth and maturing of ACT UP, the main activist organization, and it’s heroic leaders. Then I watched “The Gate Keepers,” which significantly and for the first time ever, interviews the men who have run Israel’s top anti-terrorist organization (I didn’t write down its name and don’t have time to go back and look again at the film, but it is a well-known and respected organization). The men are all retired now, but each of them were in charge of this critical work over many years and under many liberal and conservative Israeli governments. It begins when the job meant going into the West Bank, getting to know the Palestinians, recruiting spies amongst them with whom they worked closely. But these early leaders were deeply familiar with the Palestinian community. This began to change as Jewish settlers started building their settlements in the West Bank and Intifadas started. And then changed radically in 1993 when the Oslo Accords between Arafat and Rabin was signed and would have paved the way for a two-state solution. But that’s when extremist Israelis rose up to stop the accord from becoming a reality, one of the extremists assassinated President Rabin, the accords unraveled and the job of the Israeli anti-terrorist organization became more complex, having now to survey not only Palestinian extremists but Israelis extremists as well. I was fascinated to discover that, to a man, it now seems that these former gate keepers, believe that Israel must engage in talks with everyone including Hamas and Hezbollah. In essence, their final message is “there will never be peace here unless we talk to each other.” True, I believe, everywhere in the world–talk and listen. The last documentary I watched is called “Five Broken Cameras.” Interestingly, this documentary was made by a Palestinian man who lives with his wife and sons in the West Bank. Like most of the Palestinians, they live off the land, growing their food, harvesting the olives from their ancient olive trees. The man starts with a very simple camera and films the spread of the Israeli settlements as they slowly and frighteningly encroach on the land of his village, bulldozing the fields and uprooting the olive tress, arresting and sometimes killing some villagers. The man also documents the rise of the weekly village protests, and the spread of the protest to other West Bank villages. in the course of the film, one camera after another–5 cameras in all–are destroyed by gun shots from Israeli soldiers. After a number of years and unflagging protests, the Israeli government orders the barrier to be moved back and the village regains its land. I strongly urge you all to see these documentaries. You will learn a lot and be very moved in the process. My first work day consisted of back-to-back interviews. First, however, my Glam Team, Matthew on hair and make-up done by the talented German artist Miriam Jacks who is L’Oreal’s key artist in Germany. It does take a village to do this glam stuff! I grabbed a half hour nap at lunch time, did more interviews and then got ready for the red carpet. I wore a gold Badgley Mischka dress. 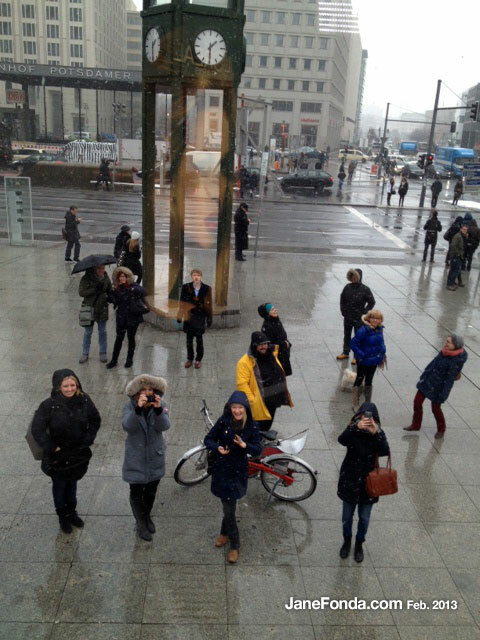 Here's a picture of me from the Front page of a leading Berlin newspaper. Here’s some video I took on the 2nd night just to give you a sense of what the Berlin Festival red carpet is like. It’s more informal and less intense than Cannes, I can tell you. 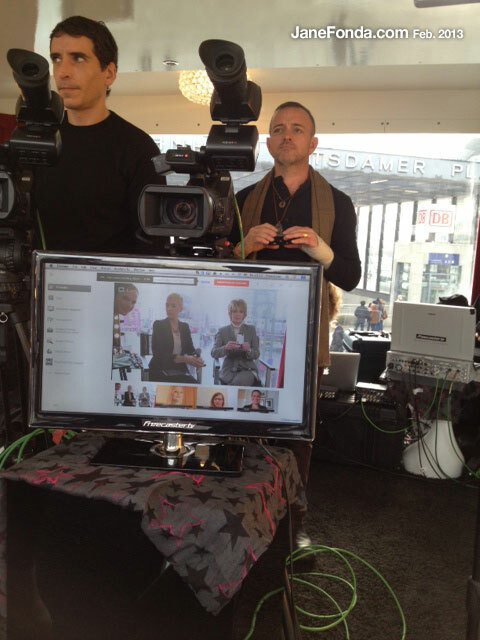 The man waving and giving me the ‘thumbs up” is Guerric De Beauregard, head of L’Oreal’s publicity and PR. I was pleased to see that 4 (a majority) of the festival’s jury members are women: Ellen Kuras, the American writer and director, Shirin Neshat, the Iranian director, Susanne Bier, the Danish director and Greek director, Athina R. Tsangari. Tim Robbins is also a member of the jury and I got a chance to talk with him briefly. Such a smart, talented, nice man. I also chatted with my friend, Isabella Rossellini, who has 3 films at the festival: one she directed, one she acts in and one, a retrospective on her mother, Ingrid Bergman, who would be 100 this year if she was still living. We watched a beautiful Chinese film, “The Grandmaster.” it is not in competition (in fact the director, Wong Kar-Wai, is president of the festival’s jury). The film is about a master of the art of Kung Fu who is killed and his daughter, also a master of this most balletic of martial arts, is determined to avenge his death. My simultaneous translation via earphones didn’t work very well so I didn’t understand much of the story but it was magnificent to look at, the acting seemed really good, I have never seen kung fu executed more beautifully and the actor who plays the daughter has the most exquisite face I have ever seen on screen. Today was more back-to-back interviews with magazines from all over Europe and South America. I am moved by how many of the journalists are not only aware of the upcoming (Feb 14th!!) One Billion Rising, but plan to rise themselves. One German writer said her entire magazine is planning to go into the street to dance and chant for an end to violence against women. The final event today was going to an unusual glass “Story Box” created in the middle of a large public square by L’Oreal especially for the 10 days of the festival. Here, the general public can make appointments to come and learn how to put on makeup. There’s a team of makeup artists, using L’Oreal’s products and I’m told from the moment the place opened, they are completely booked. This afternoon, In the Story Box, I was interviewed by my make-up artist, Miriam, and we then took questions from women via skype. Then I got ready for my last red carpet wearing a black Reem Acra gown of my own that I love…and both nights I was adorned with Chopard jewelry…loaned, of course. Tonight, in competition, was Gus Van Zant’s wonderful film about fracking, “The Promised Land,” starring Matt Damon. I got a chance to greet and congratulate both of them. Having already seen the film in the U.S., I came back to the hotel and, like Cinderella, I took all the jewels off and gave them back. And now, rather pumpkin-like, I’m wrapped in a hotel bathrobe, writing this blog and about to go to bed. I’ll get about 3 hours sleep before I go to the airport to fly to Atlanta where I get to spend a few days with my daughter and grandchildren. I’m told L’Oreal will be wanting me in Cannes again this May and, like last year, I’ll tell you all about it. For now, good night–and good luck. 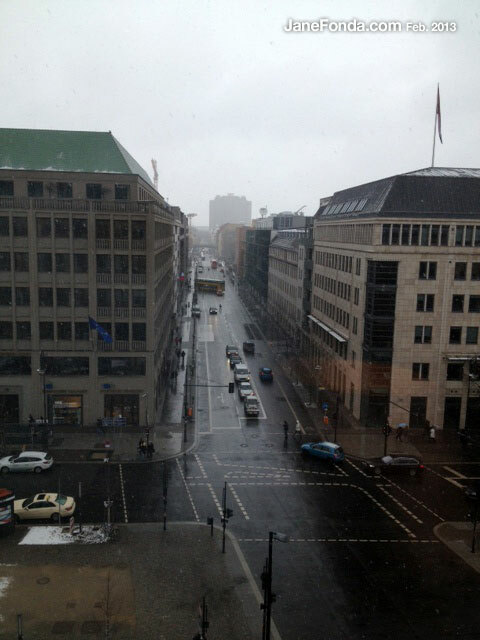 I wish I had known earlier that you were coming to Berlin. 🙁 I seriously would have bought a ticket. I would give one of my arms to meet you. Or a kidney. 🙂 You looked stunning and I hope you enjoy the heck out of your time with your family in Atlanta as well. And you started an interesting thread about the Eastern Block. If you are interested and want to dig deeper into the subject, I can recommend books to read (to grow the pile of books you have to read lol) and some movies to watch. Getting used to democracy is like getting to the light after spending some time in a cave. Your eyes have to get used to the light. As Dahrendorf says, it takes 6 months for the institutions to change, it takes 6 years for the economy to change and 60 years for the people’s minds to change. We have a lot to learn and at least here in Hungary, it’s a long a painful journey with lots of conflicts to which we don’t have solutions from the past. Moreover, the Old Regime forced people to stay away from politics, concentrate one’s own private little world, carefully isolated, which of course, still lives on in people’s minds. And this prevents us from changing the political system from its roots. And Ingrid Bergman. I adore her, especially her performances in Casablanca, Autumn Sonata and Cactus Flower. You look beautiful on the red carpet picture, Jane. Dance your heart out on Thursday, another great cause. Next time, skip the fur. Sine you note that you love documentaries, I wonder if you are familiar with the documentary film festival called hotDocs held in Toronto? I’ve attended every year for several years now. Wonderful films and many do not find distributors and,therefore, are never seen again. Unusual films, lyrical films, wondrous films. Check it out. Jane, this is an interesting, well-written account of what sounds like a fabulous trip.I particularly enjoyed the descriptions of the documentaries, some which I have read about before, and others which were new to me. As someone intensely interested in film, your synopses added to my repertoire.I plan to view all of them as soon as I discover how to access them. As usual, you were adorned beautifully and lavishly -loved that fur! You have glam down to a perfected art and I as a devotee of sartorial splendor I am an ardent admirer. Kudos all around! Jane, did you get to watch Waiting for Sugarman? It’s the fifth nominee and wonderful. Hello, Jane Fonda. Wuau! I can´t belive I´m writing this. 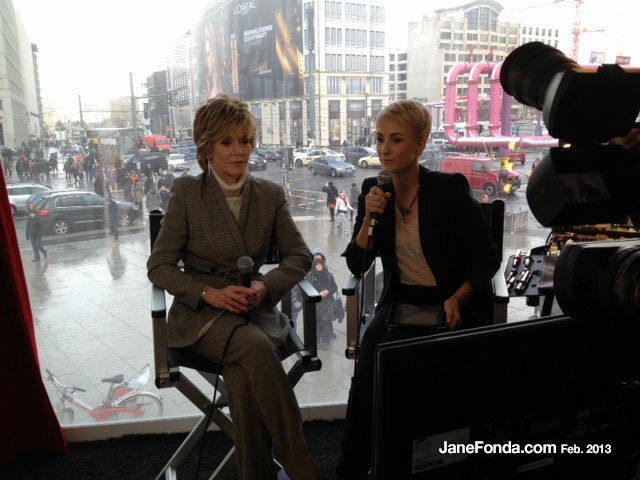 I would like to know if you are the real Jane Fonda. Sorry if I´m being rude, but there are lots of fake pages about talented actors and actresses. If is really you, what an honor. Really. Wish you good luck on Sunday, at the Oscars. Caught a glimpse of you on the telly following the Oscars. You had changed into a yellow dress and said something to the effect “I like to be comfortable when I drink.” So funny. The Oscars were very entertaining this year. I was hoping my man, Roger Deakins would win, at last, but it was not to be. I hope to meet him when I’m in Atlanta. Outstanding cinematographer. 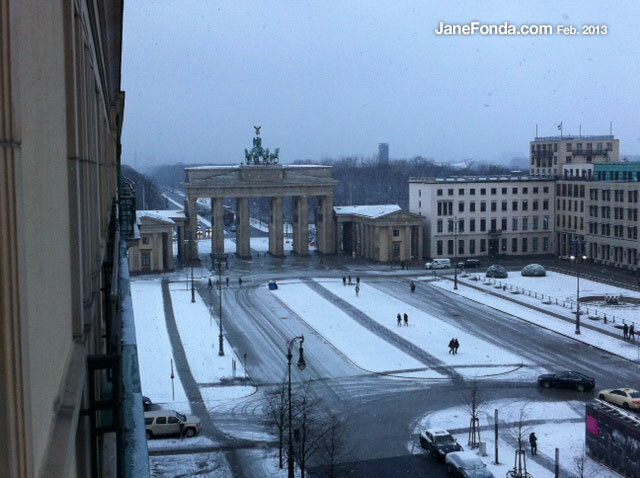 Hi Jane, I was just in Berlin for three nights and stayed at the Adlon based on your post. Thought it was the most impeccable service. Interesting fact I learned was that the hotel actually did survive the bombings, BUT the Russians used the hotel as a big party palace and all of the wine in the cellar at that time was wrapped in paper and someone lit a match. The fire destroyed the hotel – so I guess it survived the war, but not the Russian party!